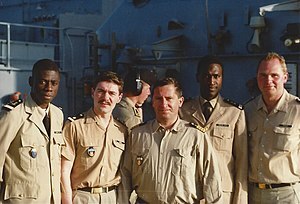 Khaki is a common color in military uniforms, as seen on these German and Senegalese officers. Khaki (UK: /ˈkɑːki/, Canada and US: /ˈkæki/) is a color, a light shade of brown with a yellowish tinge. Khaki is an equal mix of sage and buff so it is considered a quinary color. Khaki is a loanword from Hindustani (Urdu or Hindi) ख़ाकी/خاکی 'soil-colored', which in turn comes from Persian خاک [xɒːk] khâk 'soil' + ی- (adjectival ending); it came into English via the British Indian Army. Khaki was first worn in the Corps of Guides that was raised in December 1846 by Henry Lawrence (1806–1857), resident at Lahore, and Agent to the Governor-General for the North-West Frontier. Initially the border troops were dressed in their native costume, which consisted of a smock and white pajama trousers made of a coarse home-spun cotton, and a cotton turban, supplemented by a leather or padded cotton jacket for cold weather. In 1848, a khaki uniform was introduced. Subsequently, all regiments, whether British or Indian, serving in the region had adopted khaki uniforms for active service and summer dress. The original khaki fabric was a closely twilled cloth of linen or cotton. The impracticality of traditional bright colors such as the red coat, especially for skirmishing, was recognised early in the 19th century. Khaki-colored uniforms were used officially by British troops for the first time during the 1868 Expedition to Abyssinia, when Indian troops traveled to Ethiopia. Subsequently, the British Army adopted khaki for colonial campaign dress and it was used in the Mahdist War (1884–89) and Second Boer War (1899–1902). These uniforms became known as khaki drill, versions of which are still part of the uniforms of the British Army. During the Second Boer War, the British forces became known as Khakis because of their uniforms. After victory in the war, the government called an election, which became known as the khaki election, a term used subsequently for elections called to exploit public approval of governments immediately after military victories. The United States Army adopted khaki during the Spanish–American War (1898), replacing their traditional blue field uniforms. The United States Navy and United States Marine Corps followed suit, authorizing khaki field and work uniforms. When khaki was adopted for the continental British Service Dress in 1902, the shade chosen had a clearly darker and more green hue. This color was adopted with minor variations by all the British Empire Armies and the US expeditionary force of World War I, in the latter under the name olive drab. This shade of brown-green remained in use by many countries throughout the two World Wars. Khaki was devised to protect soldiers against the dangers of the industrialized battlefield, where the traditional bright colors and elaborate costumes made them vulnerable to attack. A response to surveillance technologies and smokeless powder, khaki could camouflage soldiers in the field of battle. The trousers known as "khakis", which became popular following World War II, were initially military-issue khaki-colored chino cloth twill, used in uniforms and invariably khaki in color. Today, the term is sometimes used to refer to the style of trousers based on these trousers, properly called chinos, regardless of their color. ^ Williams, Cynric R. (1827). Hamel, the Obeah man (1st ed.). London: Hunt and Clarke. p. 279. Retrieved 3 February 2016. "...A red-coat on one of these rocks will only be a mark for these rebels." ^ Byron Farwell, Armies of the Raj, 1989, page 75. ^ Tynan, Jane (2013). British Army Uniform and the First World War: Men in Khaki. London: Palgrave MacMillan. ^ Çelik, Tantek; Lilley, Chris; Baron, L. David; W3C; Baron, L. David (19 June 2018). "CSS Color Module Level 3". www.w3.org. Retrieved 22 October 2018.